The country is home to several greeny species and bluish lakes and seas, which in turn is one of the main reasons for its richness. 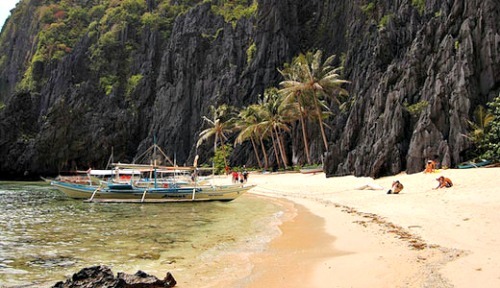 The Palawan region is the finest example to quote for its blue and lush green vegetation. This nature-tinted lonely province acts as the left arm of the Philippines where the atmosphere is kept truly blissful. Though there is so much to tell about the greenery of the province, this post would be more appropriate if it shared about the rich turquoise beauty of Palawan island and its surrounding water habitats, as the paradise is equally blessed by both the freshwater and saltwater resources! Malcapuya Island - calm white sand beaches allowing nothing but the tranquil romance of the tides just welcomes you all to take up the island tour! This crowd-less beach destination is the best among many such kind to snorkel as the marine life is found in abundance. This island is found close to other two similar islands namely, the Dicalabuan Island and the Bulalacao Island. Secret Lagoon Beach - is of course a well-kept secret as the name sounds! The beach haven has little human population and so the shorelines are kept absolutely unspoiled! This place is prominent for kayakers and honeymooners! You can enjoy walking on the soft white granules, enjoy the sun and lend a tan from its rays, admire the limestone formations on the coast and capture everything in your handy cameras to rewind the memories. Every island and beach will have a last minute hotel reservation facility online with a website hotel booking portal, if you need any last minute hotel then, just make your search on Hotelsreservation.com. Marimegmeg Beach - sipping in the sweet tender coconut juice laying on the wet soft bed encircling the ever-blue ocean water and in turn surrounded by thousands of greenish coconut trees will not be granted to everyone! Marimegmeg offers you such an exciting opportunity to enjoy the fresh breeze of the salty ocean along with the rich vegetation of coconut trees. This exotic island would just extend your happiness and adventure spirits without any limits! Enjoy the copper sulfate ocean by hopping to some islands just offshore. Kayangan Lake - the beauty of the lake is unexplainable! The vegetation under the lake is so visible that you can see them through the surface of the crystal clean water. This is such an awe-inspiring site guarded by the green mountains on all sides. You can indeed dive deep into the still fresh water to see the rocks and creeps under the water surface. Barracuda Lake - this is again another watery paradise similar to Kayangan. The walled rocky mountains surround the entire lake providing breathtaking views. You can swim next the shores or just dive into the bluest ever lake to watch the rarest motions of the water and to click pics of rarest rocky surfaces and fishes. The temperature of the water varies every inch while going deeper into the lake. Boat rides are undoubtedly a gift for the non-swimmers as the transparent lake gives you the complete scene of underwater features!